Hi everyone – happy Friday! This week’s Friday Finds is taken from a church wedding in Southville, Bristol. 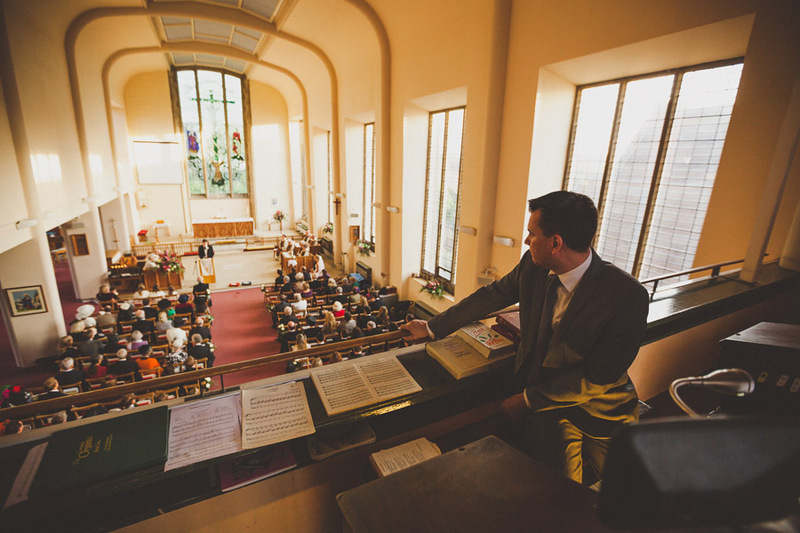 The priest here was very happy for me to quietly move around during the hymns, so I took the opportunity at one point in the ceremony to quickly nip upstairs and capture this shot of the organist looking over the whole wedding. I love the unique viewpoint it gives you and the chance to show off the amazing architecture of the church itself. It’s a view the couple wouldn’t have seen on the day, but it really catches the atmosphere of the ceremony, with the warm winter light streaming in through the side windows. Sam is a creative documentary wedding photographer based in Bristol and working throughout Somerset, the UK and abroad. His background is in documentary film making and he has years of experience of photographing weddings in a discreet and unobtrusive way.